To Kelowna for the Canadian Culinary Championships, always a highlight of the gastronomic year, the lake and the mountains looking splendid with a dusting of snow under a clear blue sky, the sun not quite taking the edge off the bitter and unseasonal cold. The judges arrived on Wednesday and began the adventure in the most delightful way with a very fine dinner at Quails’ Gate winery, hosted by Laura Kittmer and the British Columbia Wine Institute. It was a fine opportunity for the judges to get together and calibrate our palates with chef Roger Sleiman’s precise and delicious food (the char-grilled shoulder of lamb, rare but oh-so-tender, was my highlight) and with some first-class wines from Howling Bluff, Haywire, Culmina, Jackson-Triggs and Quails’ Gate itself, each one introduced by its winemaker. We have a superb posse of judges this year! Let me list them, from east to west. From St. John’s, chef and educator, creator of the cooking school and catering company Chef To Go, Bob Arniel. From Halifax, chef and educator, currently Chief Product Officer of Truleaf Plant Science and GoodLeaf Farms, Ted Grant. From Montreal, restaurant critic, writer, lecturer and anthropologist, Robert Beauchemin. From Ottawa, author and broadcaster, senior editor of Taste & Travel Magazine and former restaurant critic of the Ottawa Citizen, Anne DesBrisay. From Toronto, writer and editor, intrepid explorer of the industrial food complex, Sasha Chapman. From Winnipeg, chef, pastry chef and restaurateur, Barbara O’Hara. From Regina, author, food writer, documentary food photographer and broadcaster, CJ Katz. From Saskatoon, writer, journalist and all-round food guru, Noelle Chorney. From Edmonton, wine, food and travel writer, certified sommelier and wine instructor, the founder of Edmonton’s Slow Food convivium, Mary Bailey. From Calgary, teacher, broadcaster, author and restaurant columnist for the Calgary Herald, John Gilchrist. From Kelowna, chef instructor here at Okanagan College and master pastry chef, Perry Bentley. From Vancouver, world-renowned wine and food judge and the wine and food voice for Western Living magazine, Sid Cross. And also from Vancouver, author, teacher, restaurant critic, and the editor-in-chief of Scout Magazine, Andrew Morrison. Our Thursday party is also the occasion when each chef with his or her sous chefs meets the Okanagan College culinary students who will assist them over the weekend. 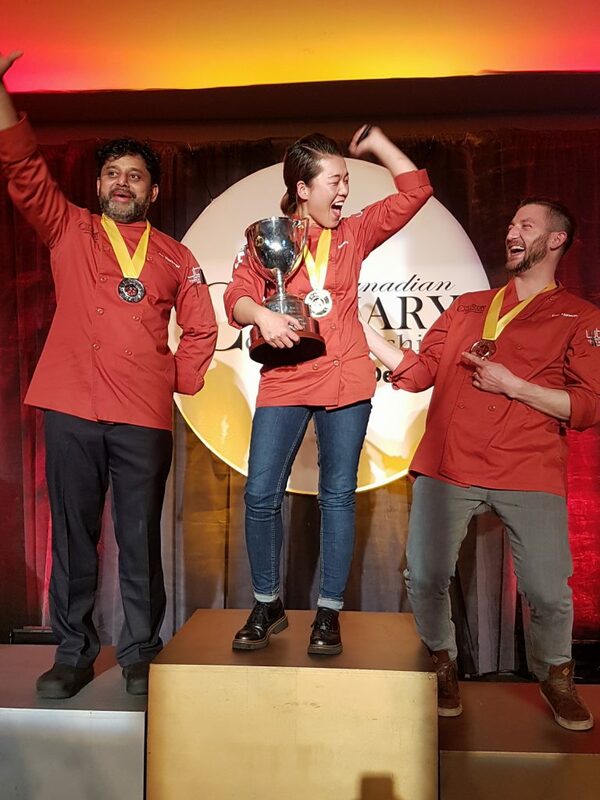 Gold Medal Plates has a very special relationship with Okanagan College’s culinary team. To put it bluntly, we couldn’t possibly hold our competition without them. We use their teaching kitchens as the venue for our black box competition and for prep for the mystery wine competition. We rely on the students for enthusiasm, talent and a ton of hard work assisting the competing chefs. And we are very fortunate in the whole-hearted support of the College’s high-powered and tireless teaching faculty, brilliant allies in our endeavour. While the chefs and their sous chefs disappeared into the night to work on their wine, the judges repaired to one of Kelowna’s finest and most convivial establishments, Waterfront Wines restaurant, where its owner-chef, the great Mark Filatow, was waiting for us with a fabulous dinner. This stop has become something of a ritual for the judges – always a gastronomical highlight of a weekend already brimming with delicious treats. And so to bed. Ever since we first staged the Championships, the Friday night Mystery Wine competition has had a different, more casual vibe than the Grand Finale on Saturday. Peter Moscone and his production team turn the Delta Grand’s ballroom into a glamorous nightclub for the 400 guests. Scattered among the chefs’ own stations are local stars offering their wares – stunning wines from the Scenic Sip group of wineries, north of Kelowna, craft beers from Tree Brewing Company, exotic iced teas from Tea for a Cause (who have supported this endeavour from its inception), charcuterie from Two Rivers Specialty Meats, cheeses from Poplar Grove and a rich oyster presentation from Kelowna’s premiere fishmonger, Codfather’s. This year’s emcee, Olympian Brian Stemmle, and the super-talented singer-songwriter Danny Michel rule the stage and a dazzling time is had by all. The judges, however, see little of this. We judge this leg of the competition blind, secluded in a private room, whither the dishes are brought, one by one, by foodrunners for our adjudication. When the identity of the wine that David Lawrason had chosen this year was finally revealed, it turned out to be the 2014 Pinot Noir Reserve from Unsworth Vineyards, grown and made in the Cowichan Valley, on Vancouver Island, British Columbia. It’s a beautifully balanced Pinot with plenty of red berry fruit – as versatile a red as one might find – and the variety of the dishes prepared by our chefs testified to its generous personality. It also proved to have hidden complexities – little aromatic nuances that various things we tasted brought to the fore. First up was Chef Thienes (Regina). His dish was beautifully presented (indeed, all the dishes were the most visually seductive I can remember for the Mystery Wine competition). He proposed two tissue-thin slices of smoked pork tenderloin carpaccio that had been rolled in black vegetable ash, the flavourful meat as tender as veal. Beet featured on the plate – first as a tiny mound of sapid jelly, then as a drizzled gastrique around the plate, and again as crunchy black matchsticks, balanced by crispy orange-coloured threads that might have been carrot or squash or yam. One third of a single fresh raspberry lay across the edge of a slice of pork – a potent berry moment that sent a shock of recognition into the wine. A smear of green seemed like a nutty herbal remoulade; there was more of the powdered vegetable ash sprinkled about and a pinch of microgreens for a garnish. Many of the elements on the plate found their own harmony with the wine; flavours were clear and honest. Dish number 2 (we later discovered) was the work of Chef Gray from Halifax. 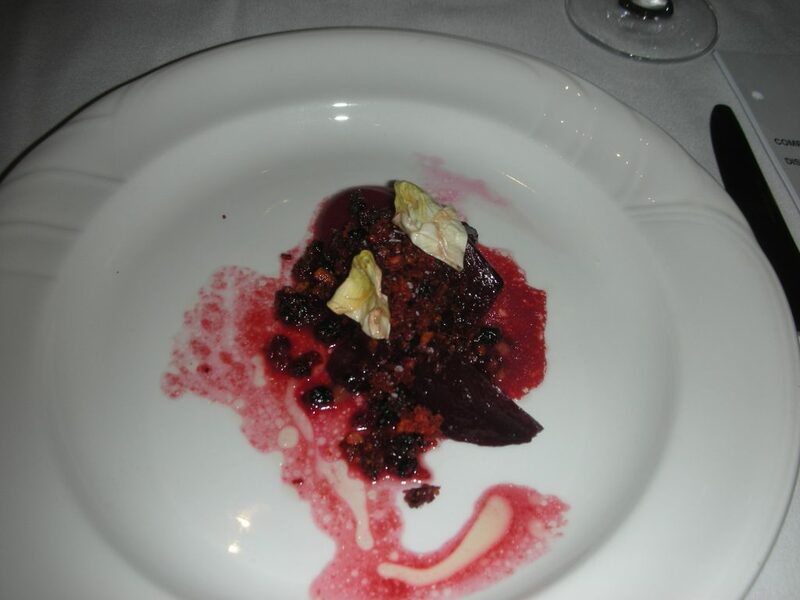 This was a heartier offering with chunks of roasted purple beet beside a pool of tangy, pungent ketchup. Strewn over all was a crumble of berries and something crunchy that might have been fried bread (one of the challenges of judging blind is the absence of any explanatory introduction from the chef) and there were two wilted petals of a leafy green sitting jauntily on top. The overall feel was of sweet-sour intensity and a strong illustration of how well beets work with Pinot Noir. Third up was Chef Tabet from Montreal. She gave us a firm-fleshed pork rib, cut on the bias and sweetly glazed. A russet jus, almost as thick and sweet as a demiglace, sauced the meat. Celeriac was a presence – as a super-smooth purée and as a juicy-crisp little curl beside the rib. A tangle of vegetable treats crowned the meat – threads of pickled onion, shredded greens and julienned radish – and Chef had dusted the dish with a spicy dust that reminded some judges of the smoky, leafy aroma of lapsang souchong tea. Dish number 4 came from Chef McCleery, representing British Columbia. His dish had a tempting fragrance of the ocean thanks to a relish of oysters, bone marrow and finely chopped herb stems spooned on top of the principal protein – two slices of well-marbled beef short rib, taken off the bone and seared to a delectable tenderness. A hank of soft black kale leaves sat alongside and the dish was garnished with a sliced drum of charred leek, individual enoki mushrooms, their tiny stalks split by the knife until they looked like minuscule jellyfish, and some shavings of radish. A piped green purée echoed the pea in the relish and the finishing sauce was a rich jus of the beef rib, spiked, we thought, with oyster liquor. The beef and the vegetables on this delicious dish were great with the wine; opinion was divided as to the match with the oysters. The next delight, it transpired, was that of Chef Wigman from St. John’s – as beautiful as it was intriguing. Her solution to the Pinot was a peppery sashimi of ling cod – and yes, the wine opened its arms and embraced the rich texture and flavour of the fish. Three dots of spiced apple purée approached from a different but equally successful direction. 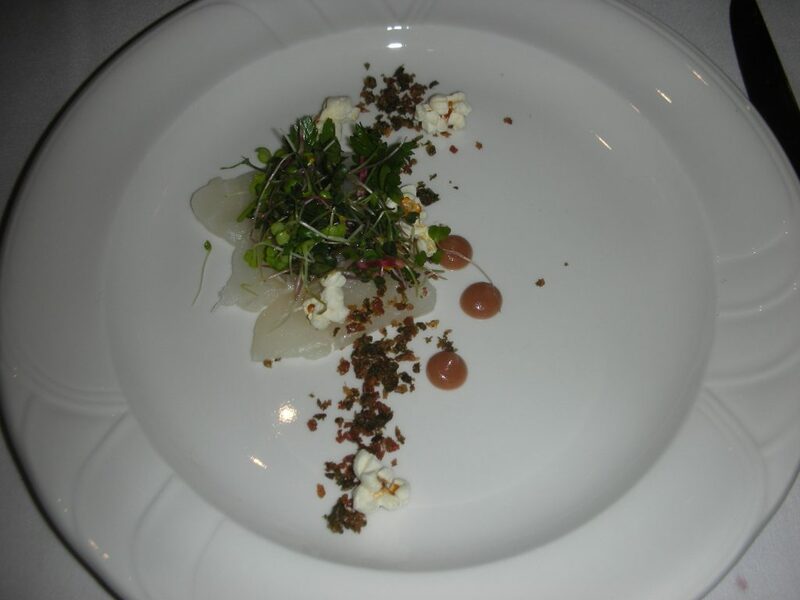 There were whole kernels of caramelized pop corn on the plate and a long, elegant stripe of crumbled bacon and capers. Flat parsely and microgreens posed as a wee salad beside the fish, with orange zest in the dressing – creating yet another original harmony with the wine. 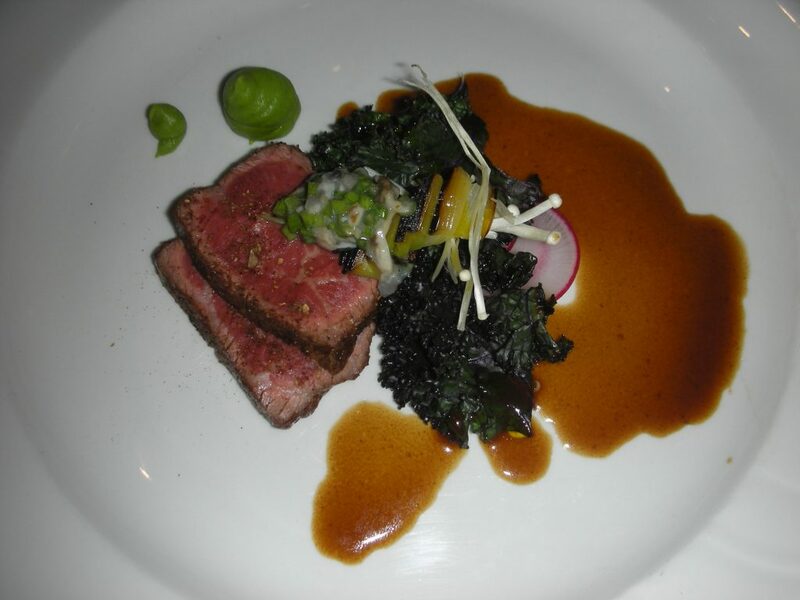 Our sixth dish – the halfway mark – was from Chef Torgerson of Saskatoon. 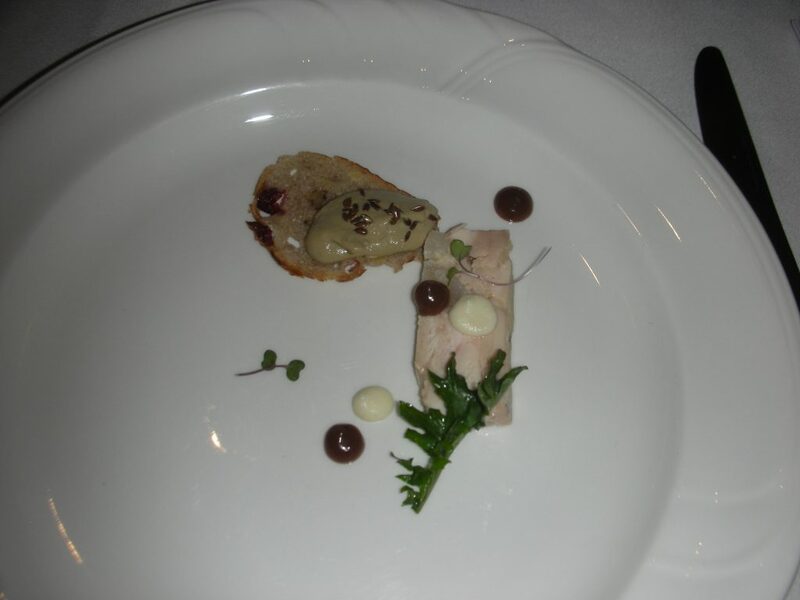 Elegant, minimalist, each component perfectly placed on the plate, it starred a slice of a demure pressed chicken terrine and a spoonful of creamy chicken liver mousse on a crunchy cranberry toast, scattered with flax seeds. 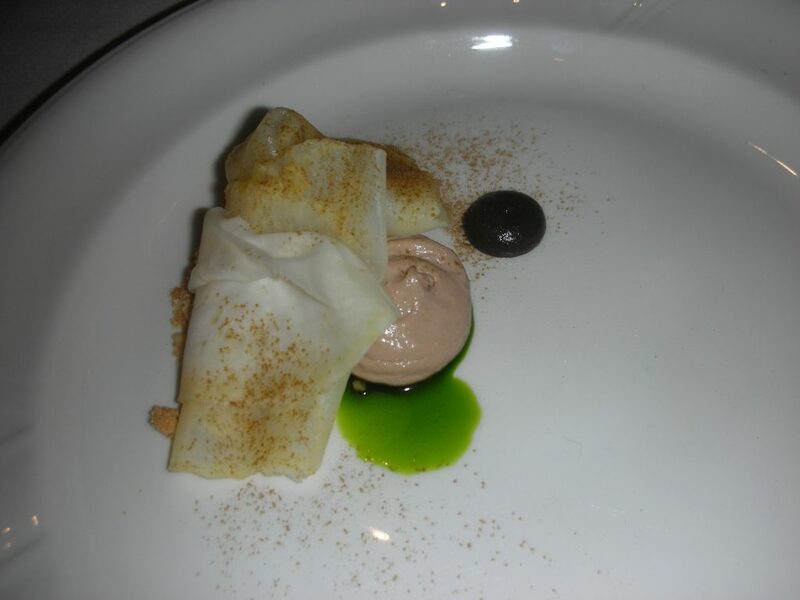 Dots of a white celeriac purée and dots of a brown purée redolent of five-spice flavours worked as condiments. Two tiny microgreen seedlings and a single, dressed green leaf finished the plate. Presenting seventh (though we didn’t know it at the time) was Chef Lee of Calgary. 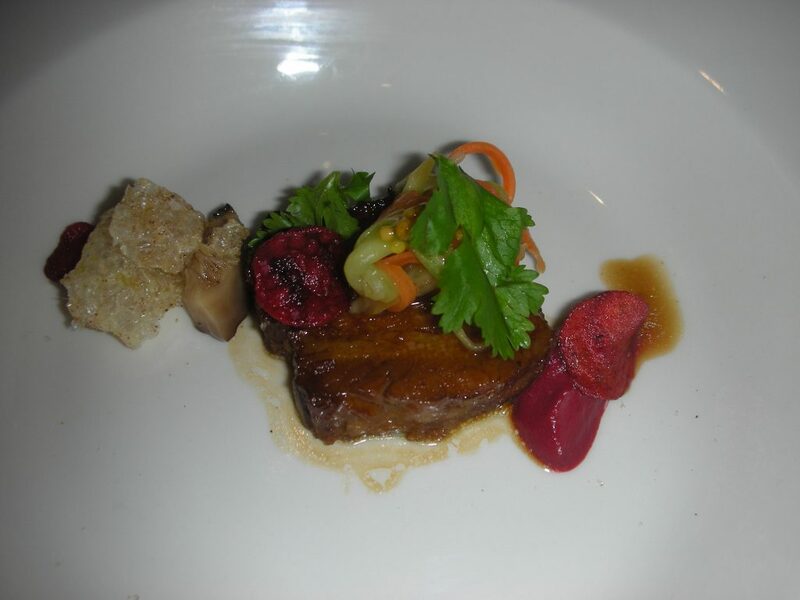 She gave us a slice of pork belly, evenly layered between lean and fat, with a sweetly tangy hoisin-like glaze. Beet featured – as crispy, dime-sized chips and as a dab of chili-spiked purée. A jumble of baby vegetables topped the meat, alongside a slice of juicy mushroom that whispered beguilingly with the Pinot Noir. 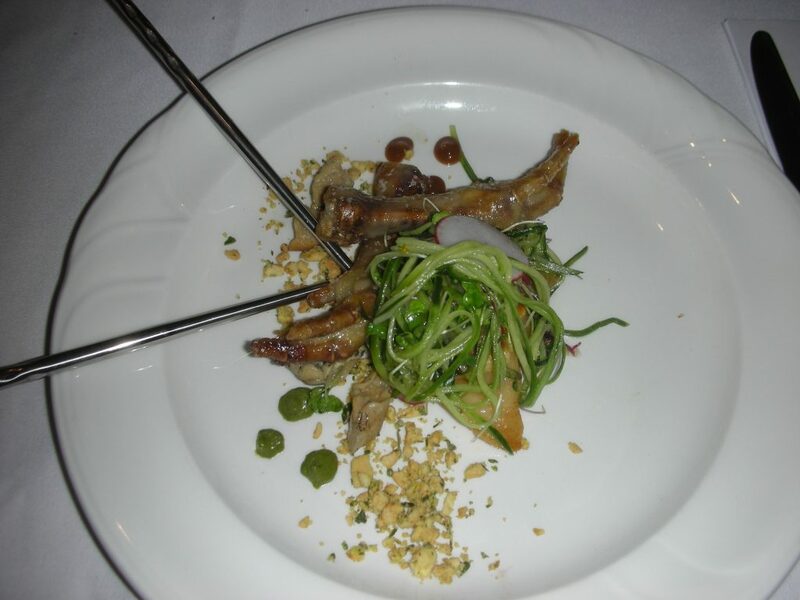 The garnish was fresh coriander and a crunchy chicheron that prickled with white pepper. The intensity level of the flavours echoed that of the wine precisely and the exotic spices danced with the red berry fruitiness in the front-palate of the Pinot. Number eight was the creation of Chef Friesen from Winnipeg. He worked with pasta, poaching a tender, rectangular agnolotto filled with a pale and peppery meat filling. On top, a loony-sized disc of supple shiitake mushroom, graced with yellow mustard seeds, served most persuasively as ambassador to the wine. A dab of root vegetable purée anchored the pasta while a sunchoke crisp took up the sweet, rooty theme. 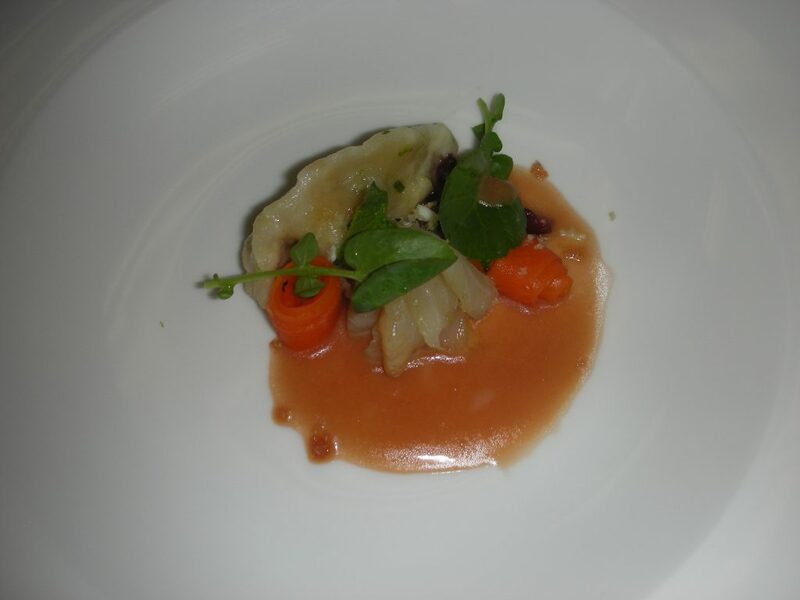 A julienne of radish and a pinch of microgreens freshened the flavours while a drizzle of balsamic finished the plate. 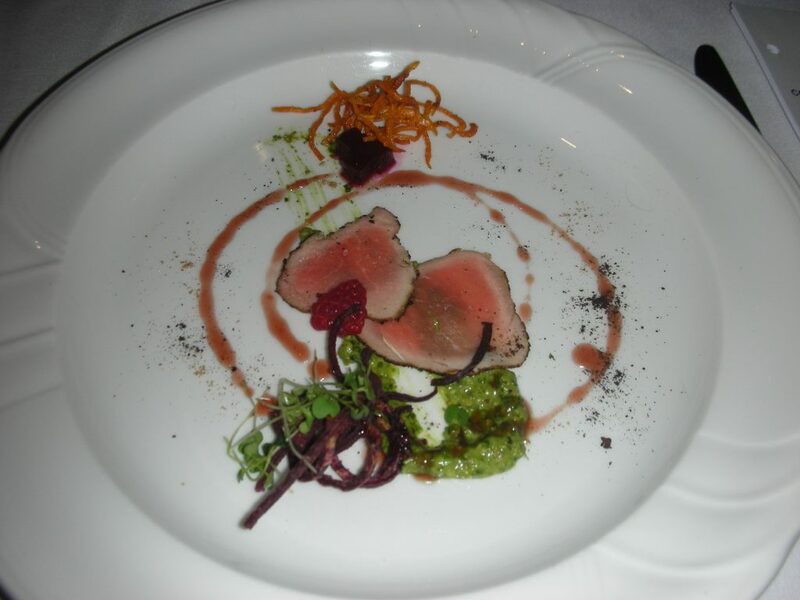 The ninth dish came from Chef Ray of Toronto – a spare presentation like a Miro painting with all the elements separate on the plate. A mound of delicious pork and mushroom rillettes was the main protein, its flavour repeated by a sprinkling of powdered mushroom on the plate’s rim. Laid out on top of it were tart, crunchy pickled onion, beet and chive while a separate dab of beet purée wore a tricorne of purple beet as a jaunty hat. Here stood a crispy puffed cracker… Boldest of all was the thin stripe of dark chocolate sauce that trailed away from a chocolate-sauced walnut, an idea that worked brilliantly with the wine. 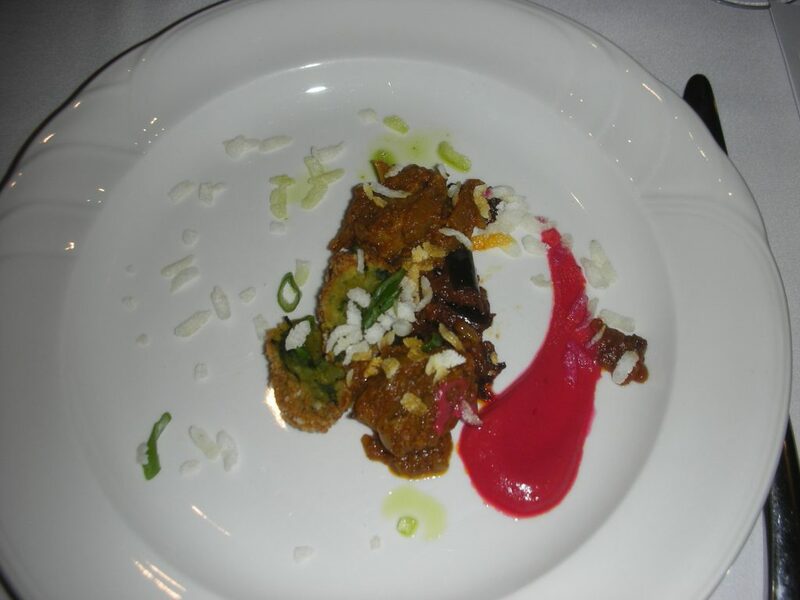 The tenth presentation was Ottawa Chef Thottengal’s preparation. An eye-catching comma of pink sauce was a highly spiced purée of beets, flavoured with a tightly knit mixture of South Asian spices, but the main event was lamb, superlatively tender and aglow with a different, turmeric-based spice blend. Nestling against it was a spoonful of a soft roasted eggplant curry. A deep-fried croquette of mashed potato and green herbs brought another soft texture, scattered puffed rice a crunchy one. The jury was divided as to how well the wine coped with the spices. Personally, I felt the Pinot’s red fruit and the food’s swirl of aromatic heat was delightful. Our final dish came from Chef Hanson of Edmonton, and here the wine-matching applause was unanimous. A swirl of creamy chicken liver paté lay at the heart of the dish, partly hidden beneath soft, folded sheets of shaved celeriac fresh from a tangy marinade. Sharing the bed with the paté was a crumble of sweet, crunchy bread like a kuggelhoff while outside it stood a dot of black garlic purée. Bright green, beautiful parsley oil was the dramatic moment of colour and the air above the plate was heady with truffle oil, an ingredient that always divides a panel of judges. And there it ended. When I entered the marks from each judge into the number-crunching program it became clear that no chef had stumbled out of the gate and no chef had raced ahead. At this stage of the race they were in a tight pack, first and last places separated by a mere six percent. Out in the party room, there was a winner, however. 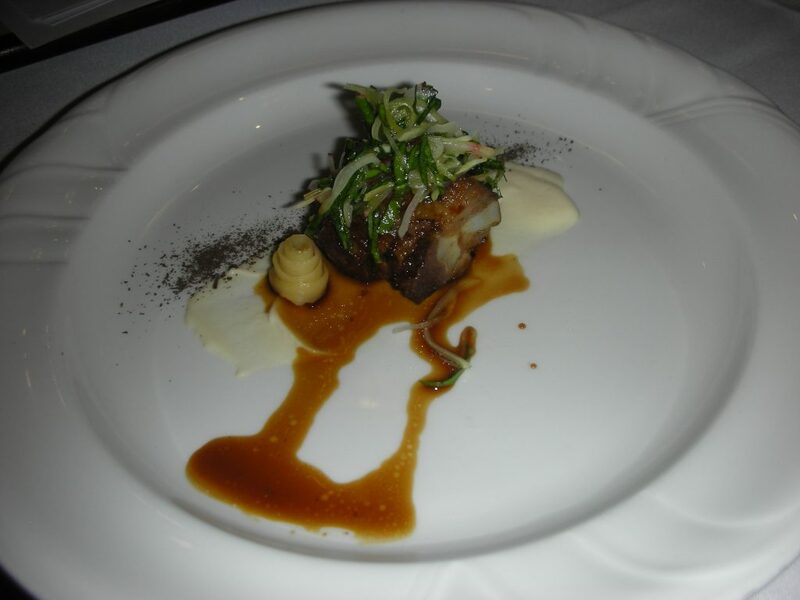 Guests who had tasted every dish were able to vote for a “people’s choice” victor, though their votes had no influence over the actual culinary judges. They voted for Jinhee Lee and her pork belly. While the party rocked on to Danny Michel’s music, the judges retired to their hotel rooms to catch some sleep and gird their palates for the Black Box competition at dawn the following day. Our Black Box competition has been evolving ever since we first introduced it, over a decade ago. This year, the rules were simple. Each chef has the same seven items in his or her box. They have to use every single ingredient in one dish. They can also use anything they want from a generously stocked communal pantry. We mark them for Taste, Visual Presentation, Technique, Wow Factor and above all, Creativity. This year’s mystery ingredients were as follows: an entire salt cod from Newfoundland, soaked in several changes of water to get almost enough salt out of it; a prize-winning wildflower honey from ZeeBee Honey out of Zehner, Saskatchewan; a ball of fermented raw foccacia dough prepared by the bakery students of Okanagan College’s culinary program; a whole savoy cabbage; 18 quail eggs; a bag of frozen Okanagan sour cherries; and four cans of Cutthroat West Coast ale from Kelowna’s own Tree Brewing Company. Nothing too obvious connecting these ingredients. Our hope was that the chefs might be challenged to such an extent that the creative juices would flow abundantly, and we were not disappointed. The big issue had to do with the saltiness of the cod. Chefs who tasted a morsel of it before planning and cooking their dish understood immediately that they would have to get rid of the salt. Chefs who didn’t ended up producing a dish marred, in some cases disastrously, by oversalting. All the chefs and their sous chefs wait, incommunicado, in a holding pen until their turn to cook arrives. Chef Torgerson (Saskatoon) was the first to be summoned. An hour later he had produced a very pretty dish, its elements gathered together, every ingredient from the box present on the palate as well as the plate. 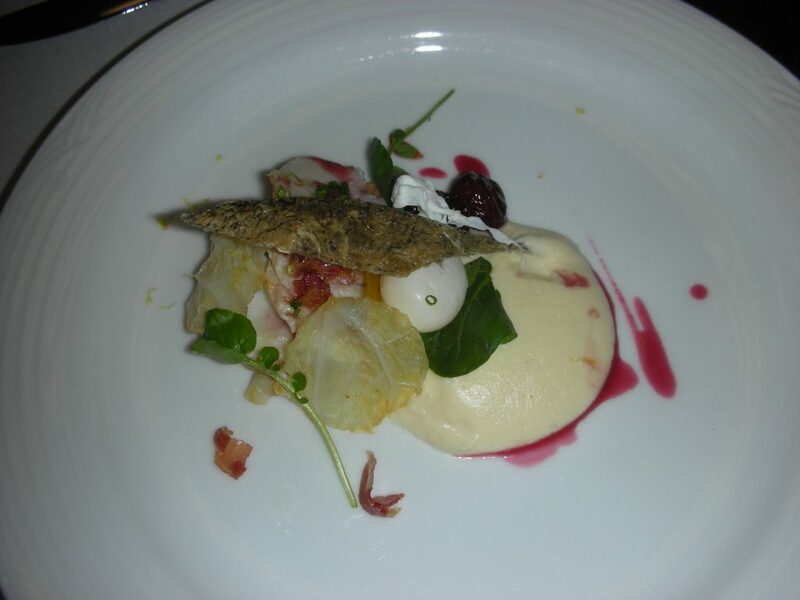 He poached the cod with soy, bacon, shallots and fish stock and glazed it with a combination of cherry, honey and beer. The raw dough became dense fried doughnuts with a sweet miso and honey glaze while the cabbage was delicious, braised with chopped bacon. The quail egg was poached to perfection and set on top of the dish alongside a fresh garnish of flat parsley and tatsoi greens. 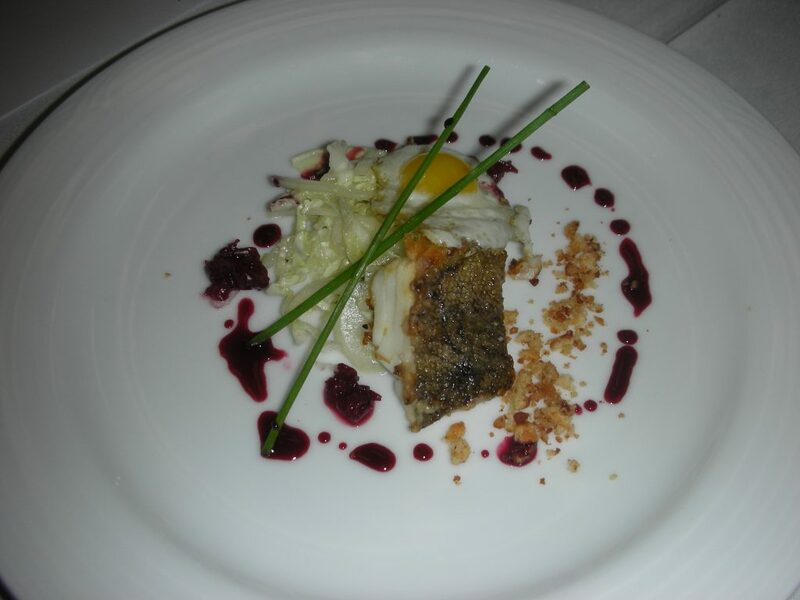 Next up was Chef Wigman (St. John’s) who immediately recognized the fish as salt cod. She decided to present it in a classic Newfoundland way, first soaking it to get rid of the salt, boning it into fillets and deep frying it in a batter made with the ale. A little lemon zest on the fish brought it up a notch higher. Chef turned the raw dough into toutons, frying small patties of it in bacon fat – crisp on the outside, light and fluffy within. She made a slaw with the cabbage, adding onion and carrot from the pantry and used her quail eggs to make a fabulous, lemony aïoli. The cherries and honey became a tangy ketchup. It was as neat a solution to this black box as could be imagined, and beautifully executed. Our third chef was Chef Thienes (Regina). He pan-seared the salty cod, setting the fillet on a dab of miso to hold it in position. He mixed the dough with ale and honey and cooked it into something like a bannock, which he then crumbled onto the plate. His cabbage became a terrific slaw with cherries involved and a sharpening edge of pickled onion and Dijon mustard. Drizzled most attractively around the plate was a sauce made from cherry juice and honey and a perfect fried quail egg crowned the creation under two crossed chives like green chopsticks. The fourth competitor was Chef Gray (Halifax) who totally aced this stage of the competition. He poached the cod in milk, coriander, thyme and garlic to mitigate its saltiness and used the fish skin to make a crisp the size and shape of a pigeon feather, flattening it then roasting it in the oven. He made flatbread with the dough and braised leaves of the cabbage in beer before cutting out small rounds that looked pretty and tasted delectably of the ale. 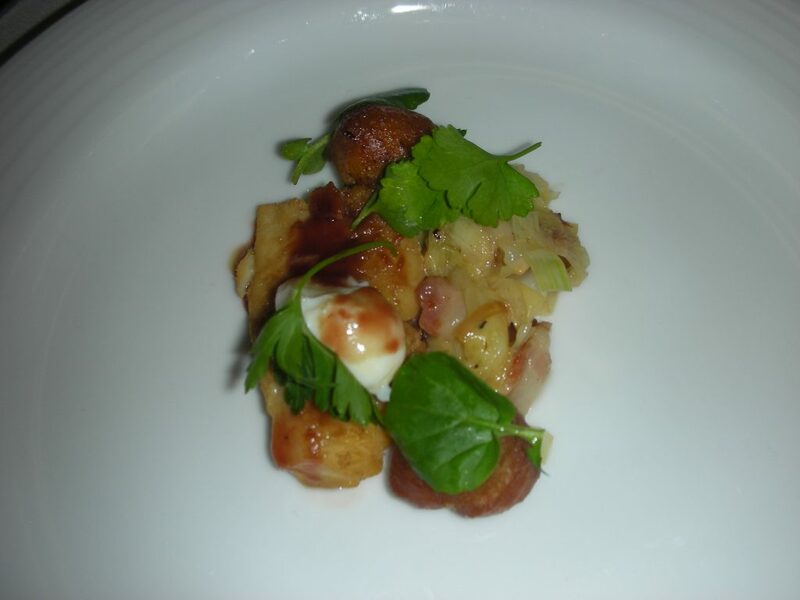 He poached his quail eggs (their texture impeccable) and made a gastrique with the cherries and honey. Chef Gray also made good use of the pantry, whipping up a silken purée of celeriac and miso, scattering some crisply fried pancetta and adding a moment of shaved golden beet to his creation. Chef Tabet (Montreal) was our fifth competitor. Soaking the cod for 15 minutes got rid of most of the saltiness before Chef shallow-fried the fish on one side only, timing it nicely so that the fillet parted into moist, glossy petals at the touch of a fork. She made an elegant flat tartine with the dough, soft inside, crisp on the surface and cut it into a long rectangular shape as a base for the dish. The beer and the cabbage became a bacon-flecked choucroute while Chef used the cherries and honey, with some finely minced vegetables, to make a condiment that cut any lingering saltiness in the fish. There were fresh fronds of watercress on the plate and a streak of cherry gastrique. Her quail egg was a real treat, partially poached then rolled in panko and set on top of the dish like a golden pom-pom. Chef McCleery (B.C.) was the sixth chef summoned to the kitchen. He soaked the cod in milk to desalinate its flesh, pan-seared it, brushed it with olive oil and chopped herbs then roasted it off in the oven. 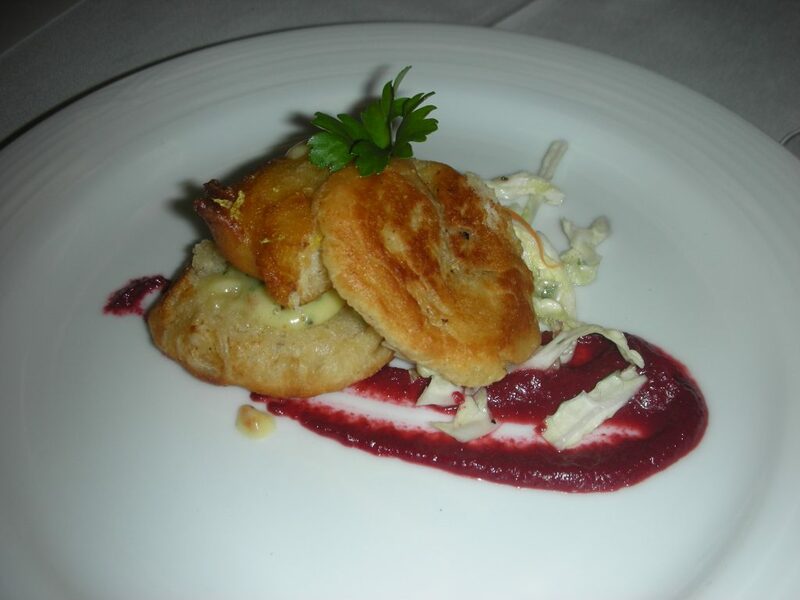 He used the dough to make a fried honey-glazed dumpling seasoned with peppercorn and coriander, and braised the cabbage with bacon and butter in a beer reduction that perfumed the air. 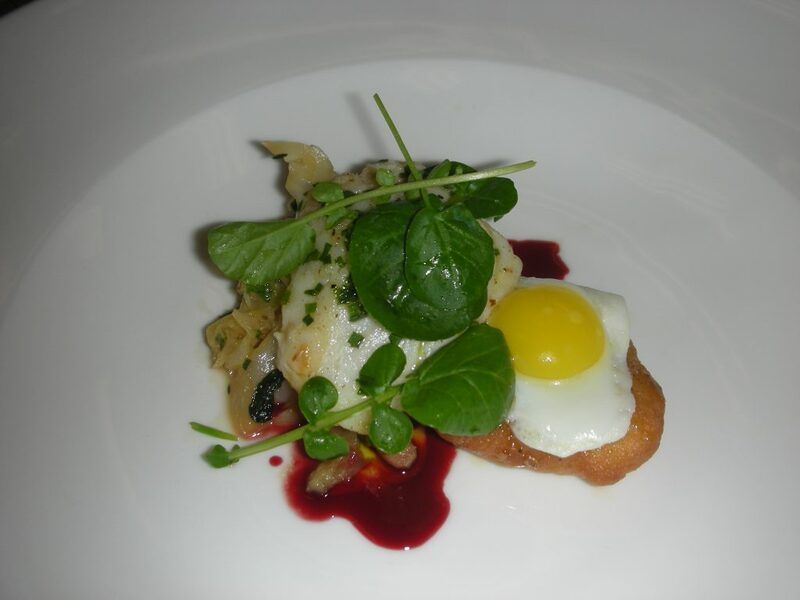 The ale also found its way into a superlative cherry gastrique, heady with thyme, and the quail egg, expertly fried, was the dish’s final flourish – that and some judiciously placed watercress. Seventh to bat was Chef Ray (Toronto). She cooked her cod in milk with tarragon, thyme and citrus, flaked the fish then glazed it with the honey. Her solution for the cabbage was to braise it in the ale while she turned the dough into flatbread topped with juicy caramelized onions. The dish’s tour de force was a splendid cherry chutney made with tarragon, jalapeño, mixed herbs and red wine vinegar. 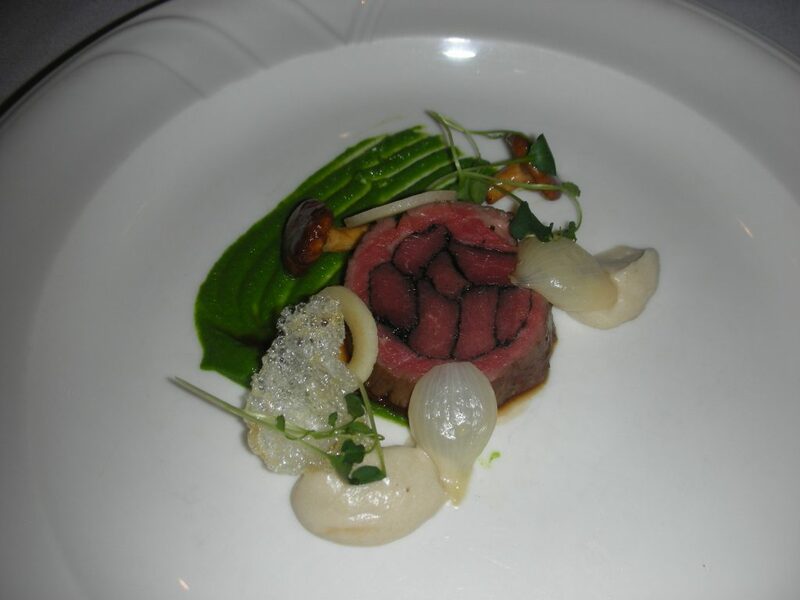 Eighth up – Chef Hanson (Edmonton) with a dish like no one else’s, earning high marks for creativity. 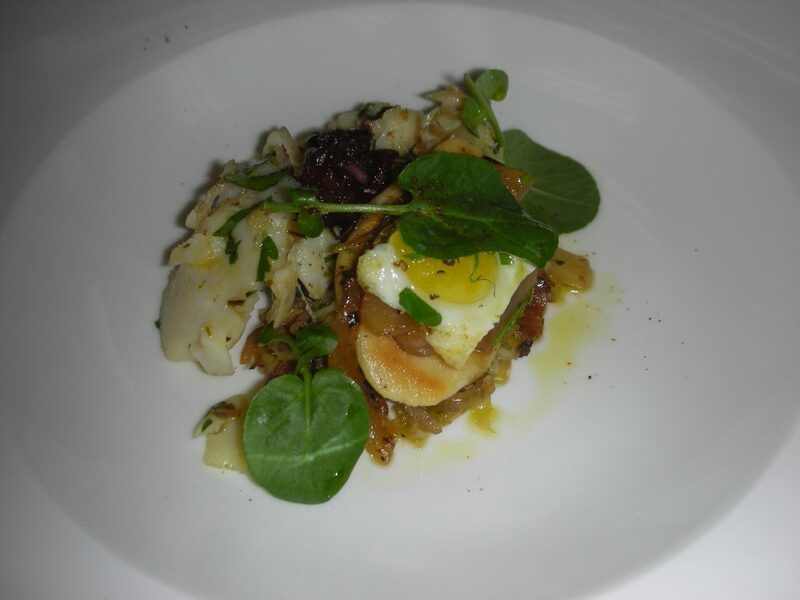 He made a brandade of the salt cod and used more of the fish to make a sauce that he emulsified with quail egg and brown butter. He seasoned the dough with thyme and salt, formed it into little balls and fried them in a pan. The cherries became a tangy pickle while the cabbage was transformed into dark oven-roasted chips. 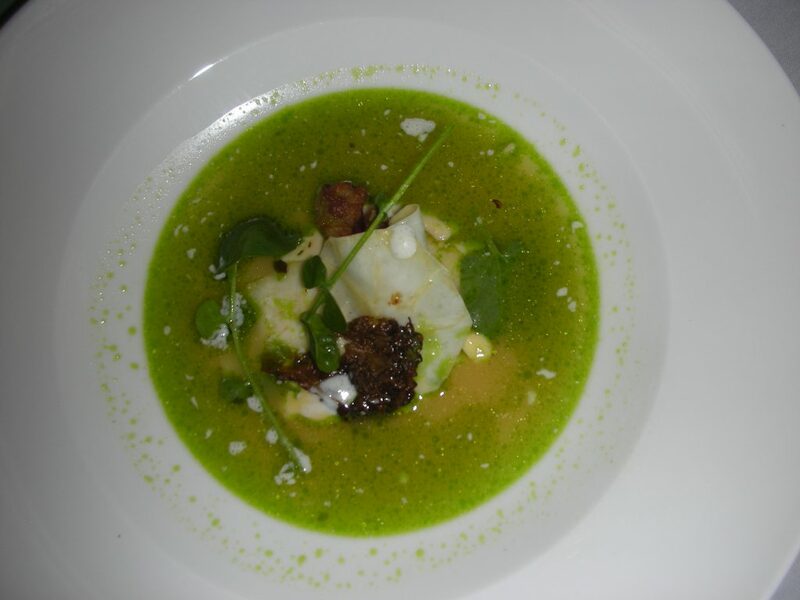 Chef added celeriac ribbons, poached in a beurre monté and then finished the dish by flooding it with a delicious broth that was flavoured with the beer, honey, bacon and chicken stock from the pantry, all turned a vivid green with a dosage of leek oil. Our ninth competitor was Chef Friesen (Winnipeg) who seared his cod with sugar, chilies and salt then glazed it with honey, butter and basil. He added chilies and cumin to his beer-braised cabbage and made a roasted garlic crouton out of the bread dough. A sour cherry gastrique added tang and colour to the plate while the pantry provided a slice of purple beet and some sliced and fried shiitake mushroom. A fried quail egg topped things off. Cooking tenth (and by now the chefs who remained had been waiting all morning in their cell) was Chef Lee (Calgary). She too showed the value of thinking outside the box. She took the foccacia dough, rolled it and steamed it like a dumpling wrapper – the transformation so thorough that some judges believed she must have used another ingredient. She turned this into a mandoo dumpling (like a Korean-style gyoza) filled with cod and cabbage that had been sautéed with shallots and cilantro. Sussing the saltiness of the cod, she re-cured it quickly in ale with sugar, taking away the salinity; then she sliced the boned flesh into sashimi and set it beside the dumpling. The quail eggs became a frikake – the yolks cooked and crumbled with salt, sugar and breadcrumbs then sprinkled over the dish. 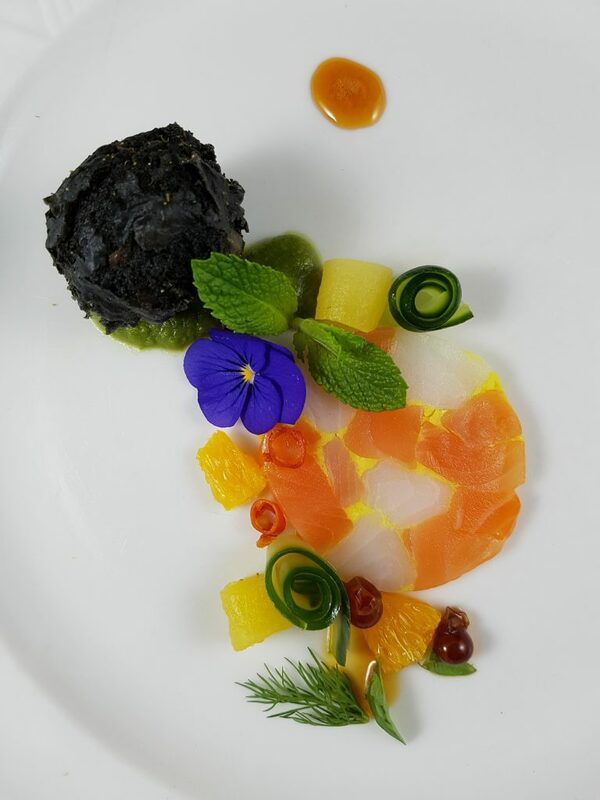 Rolls of pickled carrot ribbon, mint leaf and watercress brought other flavours into play while Chef finsihed the dish with a glossy sauce – an emulsified vinaigrette made with cherry, honey and soy. And so to our final competitor, Chef Thottungal (Ottawa). We wondered what he might do with the raw dough and he did not disappoint, transmuting it into a roti stuffed with cumin-scented potato. Everybody got a triangular slice. He chose to poach the cod in beer with star anise and other masala spices from the pantry, then crisp-fried the fish trimmings with coriander seed. These elements were set on a bed of cabbage and carrot foogath, the vegetables julienned then stir-fried with cumin and salt. Tomatoes cooked with ginger served as one adornment; another was a honey-infused cherry chutney, spiked with ginger and jalapeño. 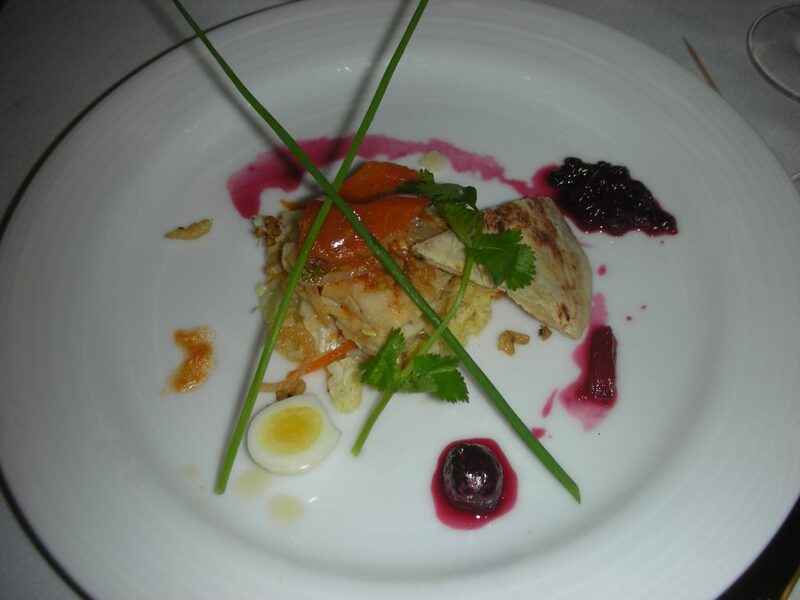 Half a miso-poached quail egg sat aloof from the rest of the food, while chives and a sprig of cilantro garnished all. The Black Box was over. The chefs and sous chefs headed swiftly back to the Delta to start prepping their dishes for the Grand Finale. The judges walked the 45 minutes back along unploughed sidewalks to the hotel, fervently hoping that salt cod was not on the menu that evening. The Grand Finale. Crunching the numbers after the Black Box, it was clear that the tight pack had split into two groups and that, unless something very unexpected happened, there were now just six chefs within reach of the podium. The first dish we tasted was from Chef Hanson (Edmonton). He presented a single Pacific spot prawn caught in its season and frozen at sea in salt water. Chef poached it in a smoked sturgeon broth, peeled it then placed it on a dot of charred kelp brown butter emulsified with egg yolk by way of a bridge into his chosen wine. 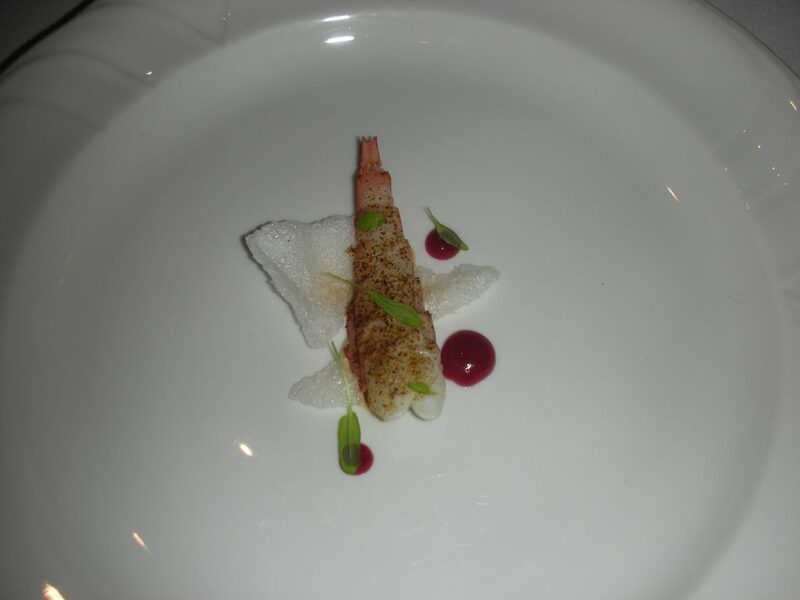 A prawn and tapioca cracker lifted the spot prawn’s tail but the other key flavour was plum – a plum powder sprinkled on the prawn and three dots of a ginger-spiked umaboshi plum purée beside it. That was it – a dish no bigger than two or three bites, elegantly simple but with enough going on in terms of flavour to fully engage the judges’ attention. Chef’s wine was Culmina 2015 Unicus Grüner Veltliner from Oliver, B.C. (I believe it is currently Canada’s only Grüner), a big, dry, racy wine that worked well with the plum. 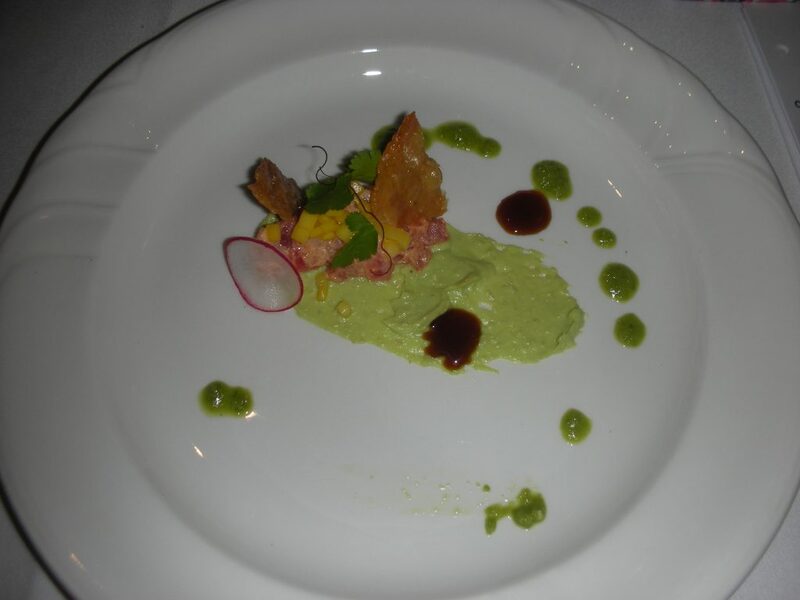 Chef Friesen (Winnipeg) now brought in his dish, a tartare made from Ocean Wise-approved yellowfin tuna seasoned with mesquite and chili aïoli. On top of this pink mound lay a brunoise of pickled mango and toasted fennel; at its foot stretched a drift of green avocado crema. Two crackers made of crisp chicken skin were the ideal tools to rake through the crema, gathering further flavours from green dots of preserved serrano chili sauce, sweetened with honey, and black dots of unagi sauce. Cilantro leaves, red chili threads and a disc of shaved radish were the final ornaments. And the wine? Okanagan’s own Quails’ Gate 2015 Dry Riesling – lovely with the tuna and standing up manfully to the various chili iterations on the plate. Our third dish was a doozey, courtesy of Chef Thottungal from Ottawa. 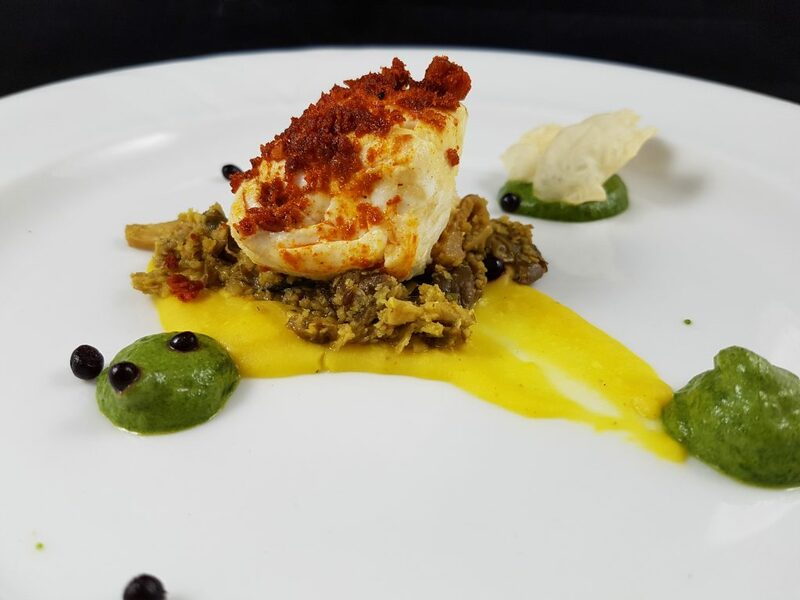 He began with Pacific halibut, marinated overnight in green mango juice, garlic and sea salt then slow-poached at his station in canola oil infused with half a dozen spices. Rather than mask the succulent fish in a sauce, he made a separate fish curry using chili, turmeric, garlic, ginger, smoked black tamarind and coconut milk then dehydrated it into red powdery crumbs. He sprinkled them over the halibut adding amazing nuances of flavour. The fish was set upon a mound of moist aviyal made with six different kinds of mushroom cooked in coconut, cumin, green chili, curry leaves and coconut oil. Several sauces brought yet more aromatic depth. Mustard and asafetida spiked a lentil and ghee emulsion; dots of green purée turned out to be spinach and coriander hariyali. 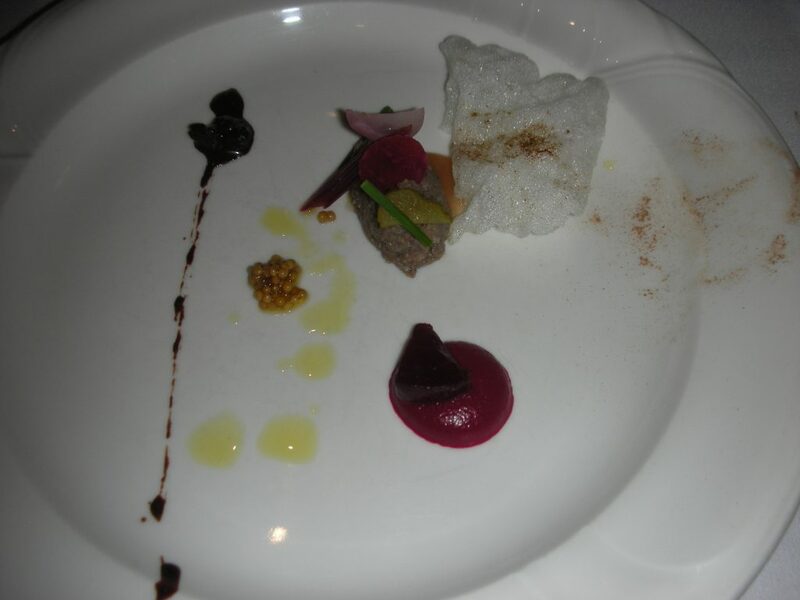 Finally, as a gesture to molecular gastronomy, Chef scattered some purple pearls of a beet and ginger jelly, and topped everything off with a tiny maple-leaf-shaped poppadom. His wine match was one of the highlights of the evening – a beautifully balanced off-dry 2015 Riesling from Huff Estates in Prince Edward County, made with Niagara fruit. Chef Ray from Toronto went fourth. She took a St. Canut piglet and slow-braised the cuts of meat in milk with lemon and laurel until it was awesomely tender and sweet. Then she used the milk solids left from the braise in a soft, gentle turnip choucroute, served on top of the pork. A second sauerkraut involved fermented cabbage, crisply fried with five-spice. The shoulder of the piglet was used to make a cotecchino and each plate received a half-moon of the rich, gelatinous sausage, its flavour deepened with a hint of Christmas spice. Squash smoked in hay was puréed with smoked milk and smoked cream while a gastrique of laurel oil, squash and apple cider was solidified and cut into small orange-coloured squares. A puddle of laurel oil and a dried laurel leaf finished the plate. Chef’s wine match was impeccable – Cave Spring’s 2015 ‘The Adam Steps’ Riesling from the Beamsville Bench in Niagara. Our fifth dish came from Chef Lee (Calgary), a contemporary take on the Vietnamese Cha Ca La Vong (literally, “fried fish from the La Vong area in Hanoi”). It began with citrus-cured fillets of salmon and sable fish rolled in vivid yellow turmeric butter then pressed into a terrine. 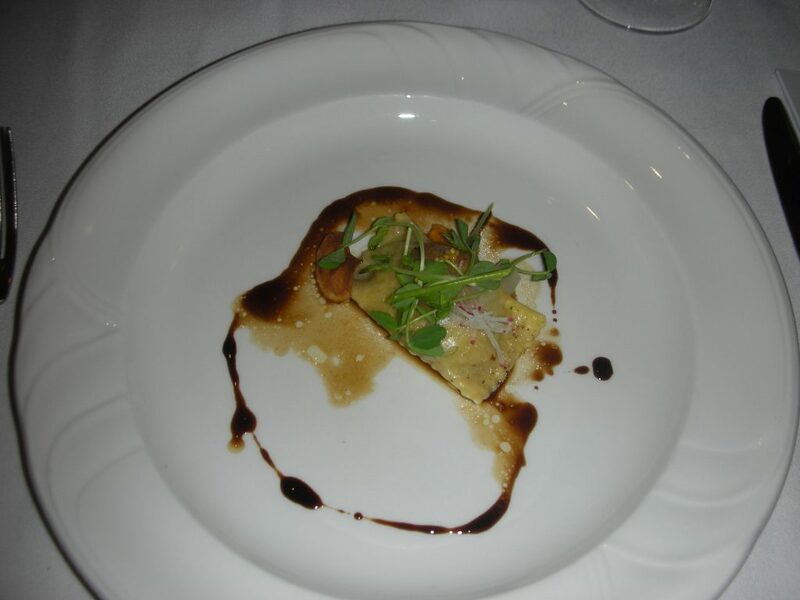 A thin slice of this exquisite mosaic adorned the plate, set beside a black ball that was actually a beignet of charred taro and chive filled with crab meat, its robust texture in delicious contrast to the terrine. The beignet rested on a shallow, bright green purée of confited dill and green onion. All the other elements on the stunningly beautiful plate were there to flatter and compliment – dots of an anchovy-pineapple sauce; spirals of olive-oil-compressed cucumber; two beads gelled from a dashi broth; fresh mango dice; segments of fresh orange; minced chili bringing a moment of heat; edible flowers and fresh mint and dill leaves for their fragrance. Chef paired her dish with Bartier Bros. 2014 Gewurztraminer from the Okanagan, a dry, racy Gewurz’ that rang bells with the turmeric and chili. 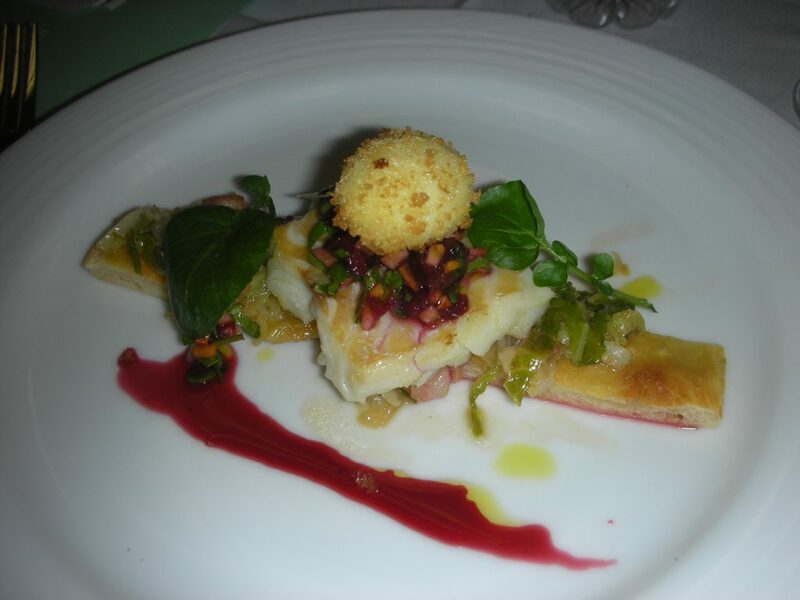 The sixth dish to appear was ushered in by Chef Wigman from St. John’s. It had seemed a bold idea when I tasted it in St. John’s; it seemed just as bold here – crispy fried chicken feet seasoned with citrus salt. Around the feet were some whelks, cooked sous vide for 12 hours until they were tender, and a fine, plump Sichuan-style dumpling stuffed with braised pork and chili. Dots of green scallion purée were a tangy compliment while a cashew crumble provided textural variety. On top of the dumpling, Chef set a tangled pickle of julienned cucumber, sliced radish, roasted shallots and mixed microgreens in a rice vinegar and honey dressing. Her chosen wine was the Arrowleaf 2015 Gewurztraminer from the Okanagan. 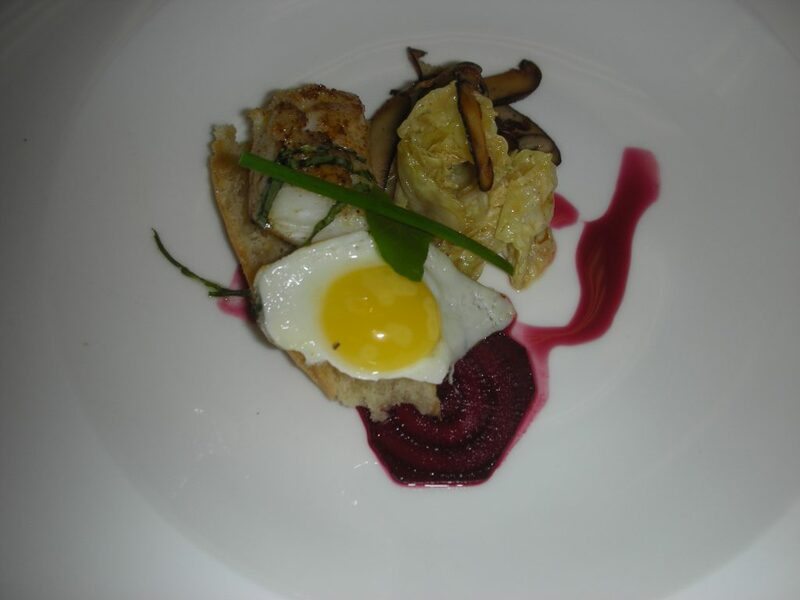 Up next was Chef McCleery, representing B.C., who presented the Championship’s only vegetarian dish. 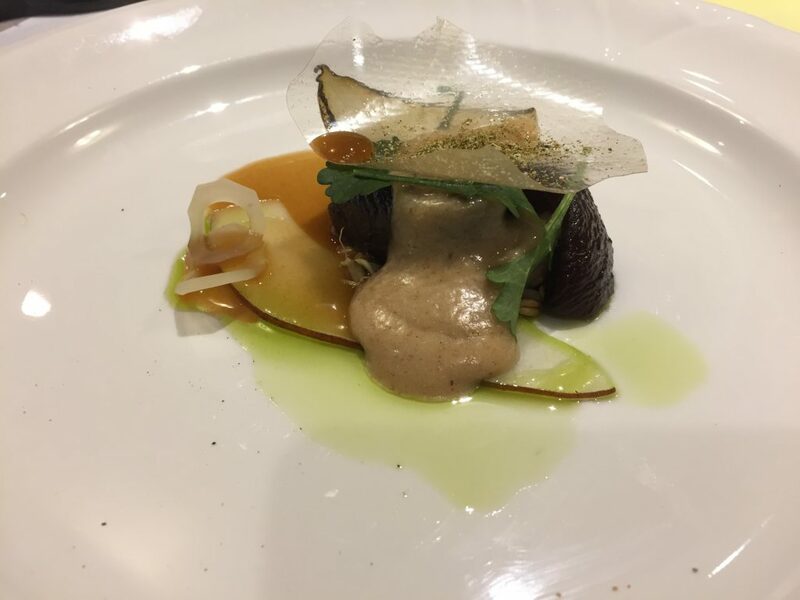 At its heart was a rutabaga that had been slow-baked in hay, then smoked, then cooked sous-vide with fresh pear juice and kelp from the beach close to Chef’s restaurant on Galiano Island. Dehydration is the next step, until the vegetable’s flesh has a texture and an umami level somewhere between a steak and a shiitake mushroom. For a sauce, Chef puréed onions that had been fermented with red fife sourdough and also used the fermented onion juice to make a translucent paper. This he set on top of the dish, dusting it with a powder made from bull kelp, lichen and wild mushroom. There was a jus made from pear juice spiked with kelp and carmelized onions, while a dainty slice of fresh pear compressed with kelp dashi brought freshness to the smoky, fermented flavours. Sea Star Estate 2015 Blanc de Noir from Pender Island, B.C., was a lovely match, a sophisticated, almost-dry rosé made from Pinot Noir. Chef Sophie Tabet from Montreal presented our eighth dish. 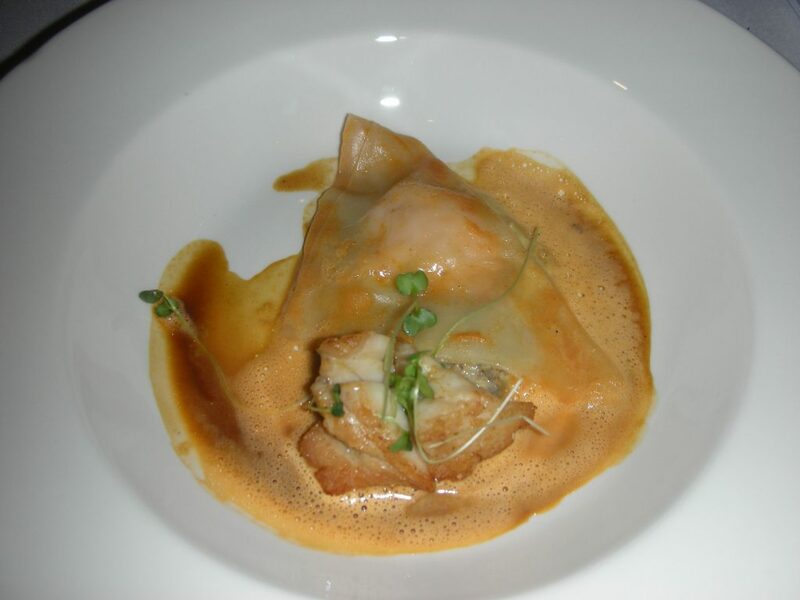 She created a single, loose raviolo stuffed with a farce of minced lobster and set it onto a button mushroom duxelles wickedly enriched with foie gras. There were two sauces, one a slightly reduced but otherwise classic lobster bisque, the second a hay-infused poultry jus. Crowning all, and unabashedly stealing the show, was a perfectly executed sweetbread crisply fried in butter at her station. Chef’s wine was a delightful surprise for most of the judges – a suave and complex blend of Seyval and Vidal, the Vignoble de L’Orpailleur 2014 Cuvée from Natashquan, Quebec. 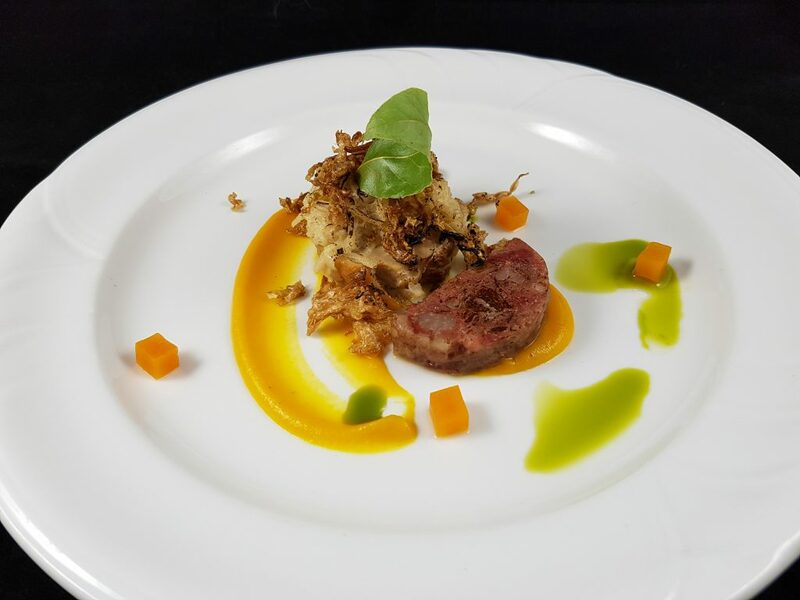 The next dish came from Chef Torgerson of Saskatoon and starred a slice of a seamless terrine made from roast elk and Cactus Lake beef tenderloins. Both meats had been cured with leek ash and powdered black trumpet mushroom as well as salt, sugar and chili, and when the terrine was sliced, the effect of black-limned fillets was disarmingly pretty. Raked across the plate beside the terrine was a purée of broccoli and nasturtium; a second purée of parsnip brought a sweeter, earthier flavour to the dish. Here was an ethereal puffed crisp that had once been beef tendon; there were crunchy petals of white pearl onion, hoops cut from poached parsnip and perfect little golden chanterelles. It was a fine ensemble, precisely paired with See Ya Later Ranch 2014 Unleashed Pinot Noir from Okanagan Falls. 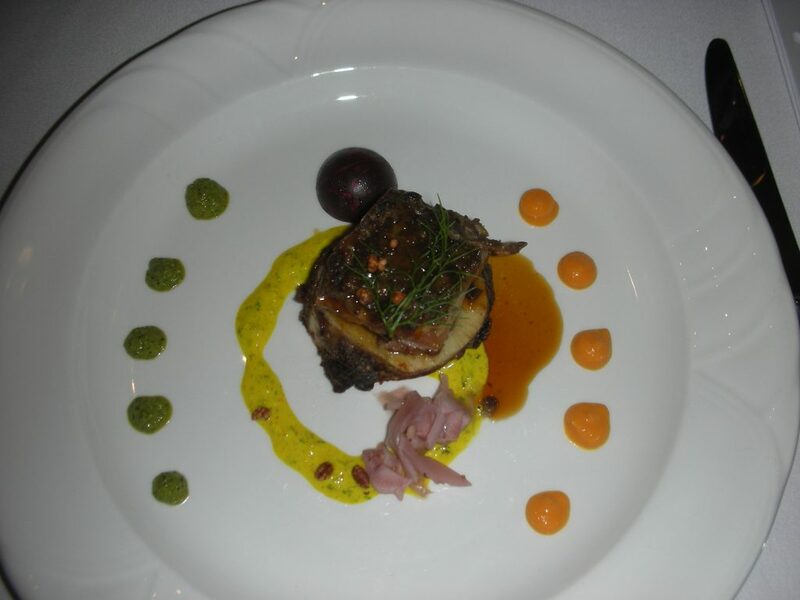 Our penultimate offering was presented by Chef Thienes, representing Regina. He chose to work with lamb belly, rubbing it with chimichurri then slow-cooking it, sous vide, for 48 hours until it was fabulously rich and unctuous. He set the meat on an impeccably cooked marrowbone filled with its marrow, upping the voluptuous ante to unprecedented levels. As well as the lip-smacking jus from the meat there were three sauces. The first was a blend of kefir, turmeric and fenugreek that tasted like piccalilli; the second was a purée of carrot and harissa, served as a line of orange-coloured dots down one side of the plate, visually balanced by the third sauce – dots of herb and pistachio chimichurri, refreshingly spiked with mint. Candied and puffed barley grains were scattered about and a mound of pickled fennel provided a tart counterpoint to the meats. The avant-garde envoi was a bonbon of dark chocolate filled with foie gras paté. Chef’s wine, Dirty Laundry 2014 Kay-Syrah from the Okanagan had fruit and an earthy edge that worked very well with the dish. The finale of our Grand Finale came from Chef Gray of Halifax, who has recently been specializing in charcuterie. 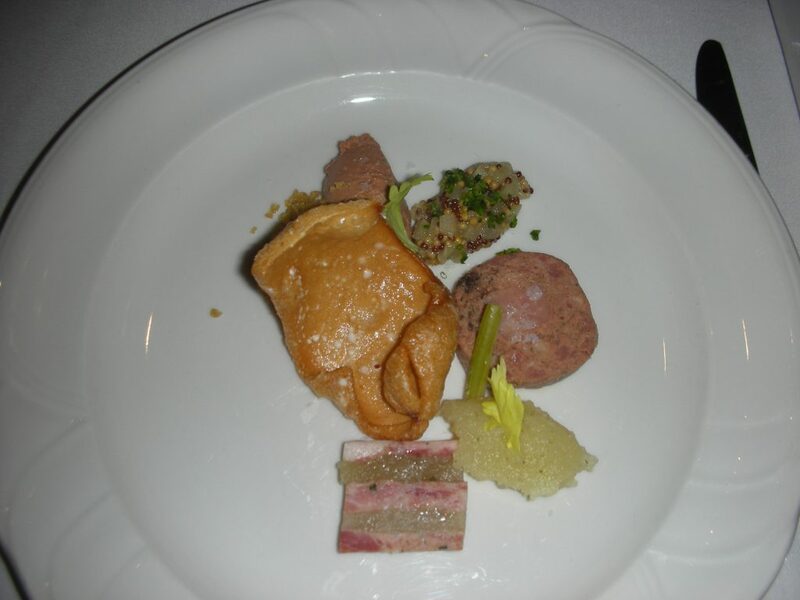 It was a classic presentation featuring three delectable creations using a Nova-Scotian-raised, goat-whey-fed Berkshire pig. At six o’clock on the plate we found a slice of a pork belly terrine, the meat layered with fennel marmalade and an apple gelee. At three o’clock was a slice of a terrine made from the shoulder meat, sweetened with dried cherry, inlaid with tenderloin. And at the top of the plate was a quenelle of mousse made from pork liver and foie gras, nestling against a mound of sourdough breadcrumbs. A crisp tan-coloured chip thrilled the judges as it melted on our tongues – Chef had used the pork bones to make a stock, stirred it with tapioca then rolled, steamed, dehydrated and puffed it to perfection. As accompaniments, we found a pleasantly bitter apple mostarda and a spoonful of fennel marmalade as well as pickled celery and celery leaf. Chef’s drink was a cocktail of white, green and black-tea fermented wild-apple kombuchas finished with a shot of Ironworks gin from Lunenburg, N.S. – a most cleverly crafted companion. And then it was time to tally the scores from the evening and fold them into the running totals. Our bronze and silver medals were separated by the merest margin. The bronze went to Chef Eric Hanson of Edmonton. The silver belonged to Chef Joe Thottungal of Ottawa. 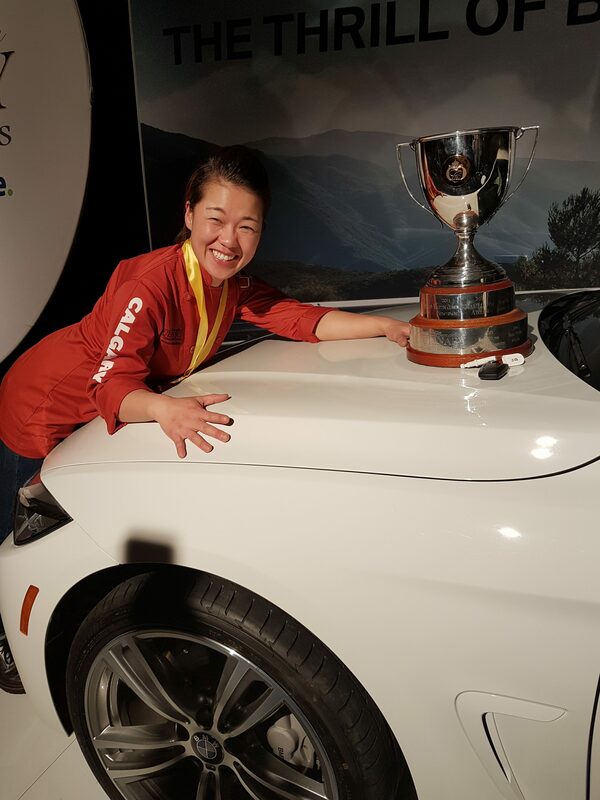 We awarded the gold, by a unanimous decision and a substantial couple of percentage points, to Chef Jinhee Lee of Calgary, our new Canadian Culinary Champion. The applause as she ascended the podium was deafening, but all 11 chefs had performed brilliantly, each one already a champion in his or her own city. Hearty congratulations to them, their sous chefs and the students who assisted them, but the loudest cheer is for Chef Lee. Way to go Jinhee Lee!!! What a remarkable accomplishment! 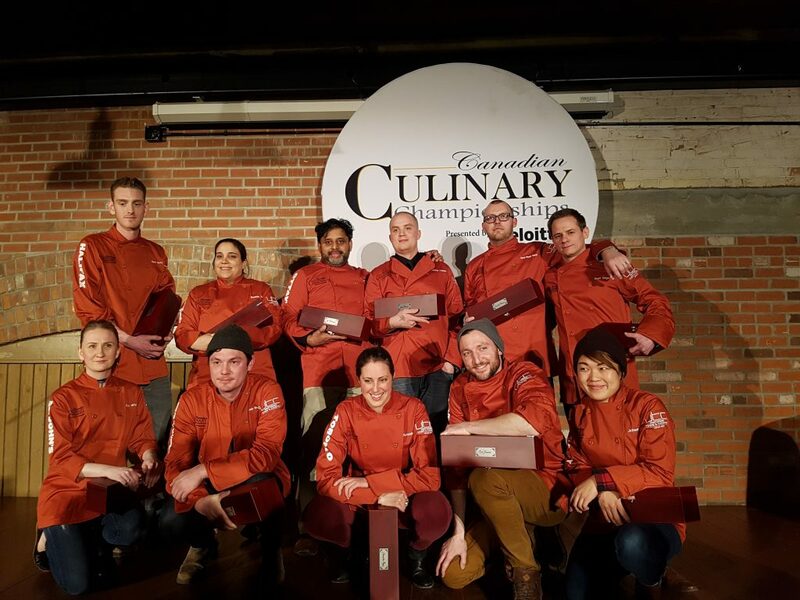 Congrats to you, your team and all the other excellent Canadian chefs that took their culinary prowess to new levels!